On From the Tofu Bowl we look at stories from around East Asian football, but how do the club leagues in East Asia compare to rest of Asia? Are the Chinese Super League and the J League the best two leagues in Asia? The only league in Asia to really compare them to is the Indian Super League, so we have a look at the Indian League after it started again this weekend. We were able to find out more about the league and what is on offer. Despite the big crowds in India, it would seem they are still a long way from Japan and South Korea in East Asia, as far as reaching the same level with their club teams as at international level is concerned. Do you think the team now known as ATK (Atlético de Kolkata) will continue to dominate the league under another English man Teddy Sheringham? ANSWER: Well, dominate is a strong word anyway. The whole league + knockout system means you don't need to dominate as such to win the title - top four places go to the semi-finals. So you can be 4th and then aim to pull off wins in a two-legged semi and a one-legged final. That said, ATK's continuity -- with players & manager -- helped in the first 3 seasons. They retained a majority of the players. This season is different because all Indian players (except two which the club were allowed to retain) went into a draft selection system. So tough to say about ATK this season but their foundations have always been strong -- and with Ashley Westwood, who made Bengaluru FC the force it is today, as Technical Director, it's a competent club. Who are the teams to look out for this season? 1) Bengaluru FC - a proper club who accomplished success even in a dying league and a terrible environment. They have a great footballing philosophy. 2) ATK - for history of consistency and, well, Robbie Keane. Who are the players to look out for? ANSWER: Berbatov, Keane, Wes Brown, Jaasekelainen, Marcelinho, Hume, Doutie. After the Under 17 World Cup we’ve seen how big Indian football crowds can be, what kind of crowds can we expect in the Super League? ANSWER: This is what I mentioned in the podcast too (link to podcast). U-17 crowds were surprising only to those who didn't follow Indian football. ISL has always drawn large numbers. (Average attendances: http://www.worldfootball.net/attendance/ind-indian-super-league-2014/1/ …). Kolkata, Kochi, Guwahati especially always draw large numbers as hubs of football. Goa too but a little less. We can expect similar crowds as those average attendances - Kochi & Kolkata will be massive. Even outside the ISL, Kolkata crowds will be massive. There's the biggest derby in Indian football in the I-League on 3 December; keep an eye out for it. How successful do you think the league can be in feature? ANSWER: It will be moderately successful, because it's driving its competitor to the ground. 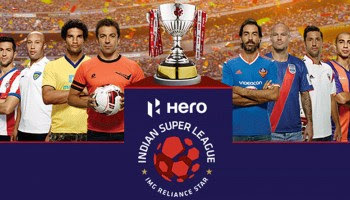 Amusing conflict of interest: co-owners of ISL are also responsible for marketing & broadcasting of its competitor, I-League, and of course it's systematically driving it to the ground. Only problem right now is that the league hasn't been set up for the long haul. Do you think an Indian Super League attracting big name players can flitter down and approve the national side? Nope. Not at all. Zilch. Nil. It's just to attract attention to the league from a promotion point of view. Sure, we keep hearing how Indian players "learn from sharing dressing room" - but that's a proper intangible and that's also very negligible. Besides, to accommodate superstar players and other foreigners, Indians are regularly played out of their primary position. After taking the time to speak with Akarsh it seems the big issue in the Indian League and other Asian Leagues is they can attract big named players because of the money but allowing this to flitter down to help how grown players is still a major project to be worked on. In China they have looked at the issue of poor goalkeepers and now have a rule that clubs can only use Chinese goalkeepers although many clubs do use foregone goalkeeping coaches. The future looks very interesting that is for sure, how the countries who have these big leagues will do at international level in the next ten to twenty years will be the telling point of if these leagues are helping football growth in these countries or just used to make people lots of money.